I read quickly. I know this because once at a seminar I took the Evelyn Woods speed reading course “pre-test” for grins and giggles. Let’s just say even the instructor agreed that I didn’t need to read any faster than I already do. But no matter how fast I read them, there are books I love to read over and over again. Some I have read so many times that the physical books are falling apart, making the invention of the Kindle more than a convenience for me. The two reigning champions in my re-reading library are Little Women and The Lord of the Rings (yes, all three books in the series). If I had to guess, I’d say I’d read each over 100 times. 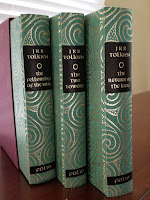 The physical copies I had of these books were so worn out that I’ve bought new copies from the “Folio” imprint, which uses high-end materials to make elegant books. Another classic I have read enough to qualify as a Folio candidate is Jane Eyre. I’m not quite into the hundreds with the number of readings, but I’m sure I’m into the mid-twenties at least. 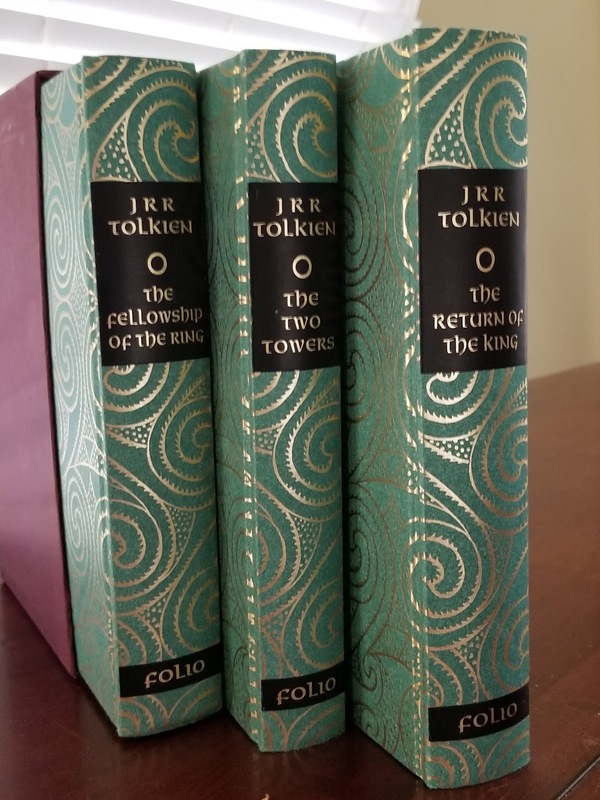 My latest copy of the Lord of the Rings, purchased last year. Not every book I have “read to pieces” qualifies as a classic. Two of my books now held together with rubber bands are paperbacks by Barbara Cartland, light romances I enjoyed but which I doubt appeal to serious literary critics. Others are science fiction or fantasy books I collected along the way, some from when I was in junior high or high school in the 1970s and early ‘80s. The Anne McCaffrey Pern series comes to mind. The physical paperbacks I have are falling apart, but the series comes in a Kindle version I’ve bought as well. Part of my Nero Wolfe collection. 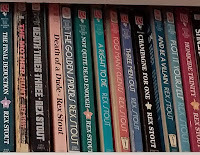 The best-loved, most-read mysteries in my personal library are the Nero Wolfe books. 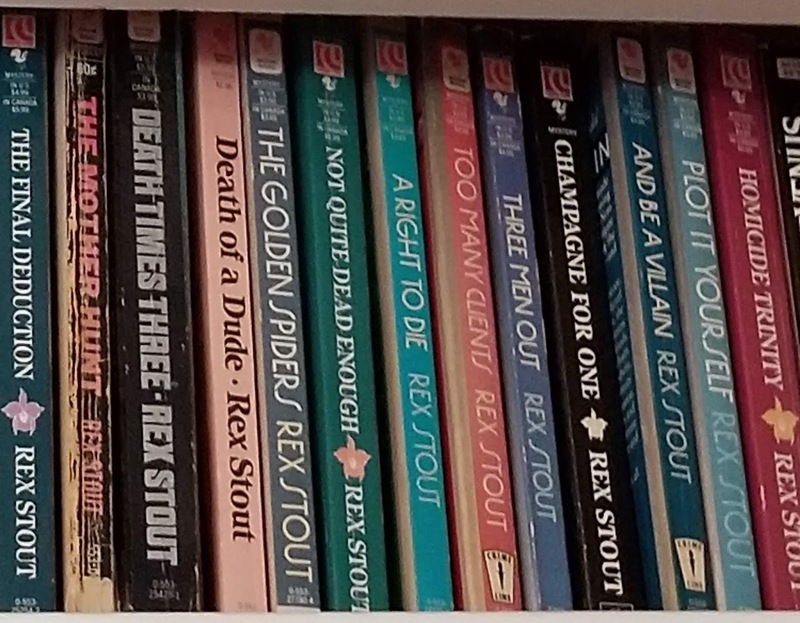 My goal is to own at least one physical copy of every Nero Wolfe book Rex Stout wrote. I’m not picky about the type or condition of the copy—most are paperbacks and a couple of the hardback versions are falling apart—but I want to own one of each. I have a good start on my physical collection, and since the books arrived on Kindle, I own a fair number of them electronically too. Agatha Christie should be represented, but she isn’t. We were a military family and moved often. The military based the amount you were allowed to move on weight, and you had to pay so much for every pound overweight. Books weigh a lot, so we kept a limited number of books (still what most people would consider a large collection) and what I read and re-read depended upon the books present in the local library. 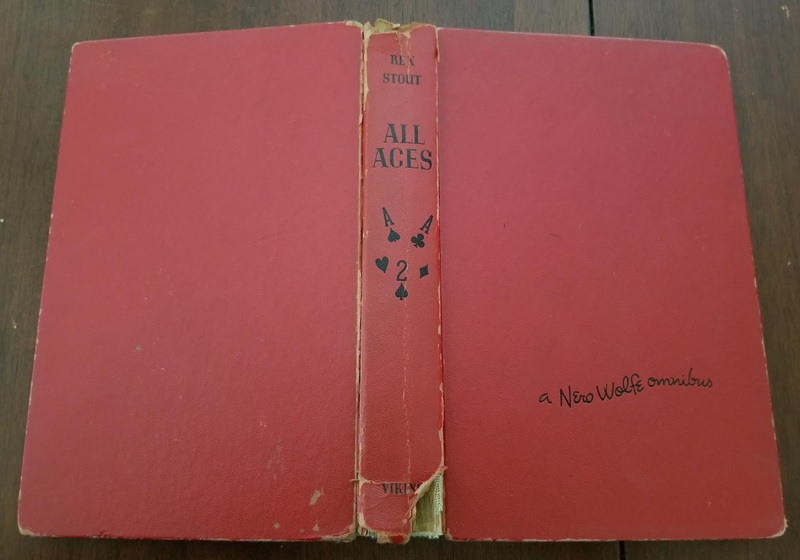 The oldest Nero Wolfe book in my collection. As you can see, condition was not an issue. Another favorite is a set of four hardback books you can’t find anywhere but on a used book site. They probably won’t show up on Kindle anytime soon, unfortunately. 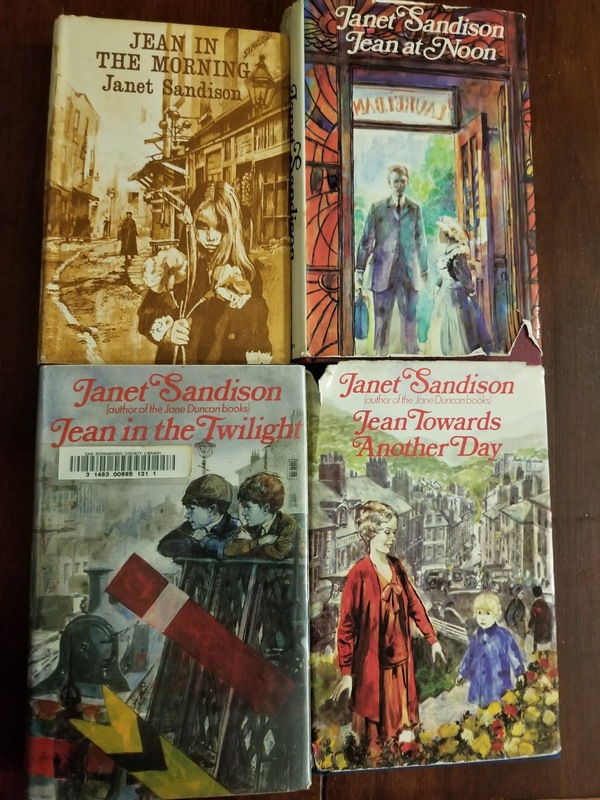 The entire set is called “An Apology for the Life of Jean Robertson.” They were written in the late ‘60s and early ‘70s by an author called Janet Sandison. I first discovered them over 30 years ago when my husband and I lived in Rockingham, North Carolina and the local library carried them. We moved back to Alabama in 1991, and I couldn’t find them anymore—until the Internet gave the used book market a global reach, and I finally found them again. I read them often, especially the last book, but given how hard they were to find, I have to treat them tenderly as I do so. "An Apology for the Life of Jean Robertson" - I still have the dust jackets intact! With my Kindle, I own entire “canons” of books I re-read frequently, including the Harry Potter canon, the Hunger Games Trilogy and a fantasy trilogy by Patricia McKillip called “The Riddle-Master of Hed.” Of those three sets, the only one not present on both my shelves and my Kindle is the Hunger Games Trilogy, because it came out late enough in the Kindle era that an electronic copy was the only version I bought. Do you have favorite books you love to re-read? How many are hardback or paperback versions, and how many are electronic? I'd love to hear about them! I don't re-read a lot of books, mainly because I'm NOT a fast reader like you are, Nancy. And there are so many books I still want to read and more coming out every week. However, I do go back and re-read portions of Craig Johnson's Walt Longmire mysteries because I love the poetry of his prose. I also own a couple of his books on CDs which I listen to on long solo road trips. My all-time favorite for re-reading is Rafe, by Weldon Hill. I find it to be an immensely satisfying read, especially when I'm not in any shape to read a new book. I have a hardback copy; it's difficult to find, and isn't in Kindle. I also like to reread several of the early Harry Potter books. I am a slow reader. I can't think of a single book I have read even three times, other than children's books. My reading list shows only a dozen or so books I've read twice. Most of those were nonfiction or books I reread because a book club chose them and I wanted to refresh my memory. I have a whole shelf of re-reads for my annual head cold: Ann Cleeves (Vera and Shetland), Martin Walker (Inspector Bruno), and Julia Spencer-Fleming (Clare Ferguson). 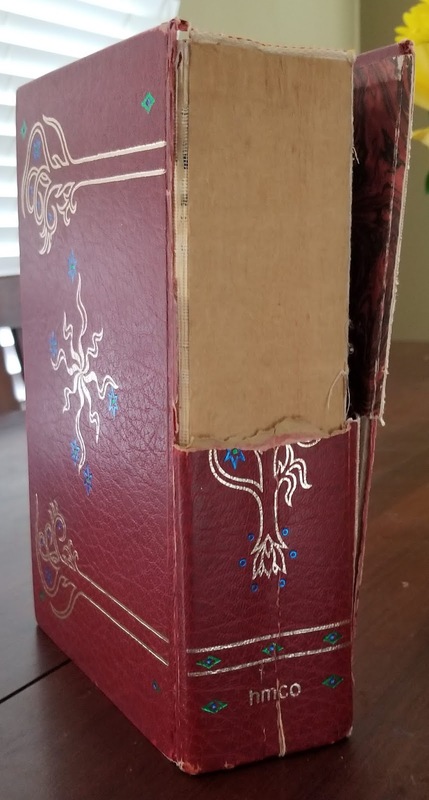 I have a couple of Harry Potter books that are falling apart like this. I re-read them almost every summer. I tend to re-read a series a year. I'm working my way through the Deborah Knott series this year (started last year) and having a great time. I've also done Inspector Morse, Peter Whimsey, and I think it's time to revisit Ruth Rendell. For some reason, A Murder of Crows just popped into my mind. Every so often I re-read Carolyn Hart's Letters from Home. I used to keep more books than I do now. A flooded basement convinced me to pass books along before they get ruined. But there are certain books that I keep, especially since they are so hard to find. I enjoy books by Jeffrey Farnol, a writer early in the 20th century. I pursue antique stores for his books, and when I find one, I feel as though I have uncovered gold. Whenever I get stressed, I reread books by Susan Elizabeth Phillips--romantic comedy with great character growth. Lately, rather than rereading favorite books, I've gotten the audio version of them. I especially enjoy the voice of some of the narrators. I've moved so many times that I've had to release many of my books into the wild. There are some I can't let go of, but I rarely reread - there are too many new books waiting! I have read the Jean Robertson series also from the library. I live and am from Holland, and the same happened in the libraries here: the books disappeared. I am still trying to find them for many years, online or in secondhand shops. If you have a tip where to find them! 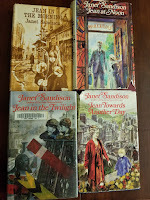 At the time my mother and I bought most books from Jane Duncan also second hand, I own them all now, I still re-read them, but Jean Robertson was very different and I would love to read it all again. I like to read and re-read M.C. Beaton books. She published about 200 books and is now most famous for the Agatha Raisin and Hamish Macbeth series, black humour and the Regency books are also very entertaining. Specially for difficult and bad times a must have for women! Which Story Should Be Next?